Your garage door depends on properly sized springs to operate correctly. If these components break, the door can become impossible to open, and trying to use it can be very dangerous. We strongly advise you do not try to open a door with a broken spring as this can damage other parts of the system, and you could also get hurt in the process. Instead, we recommend you give us a call. Our trained technicians will deal with any issues quickly and safely and have your garage door functioning perfectly in no time at all. 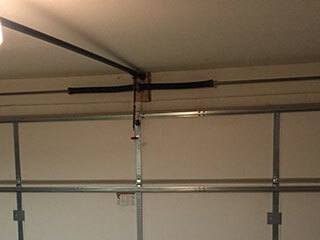 Your garage door will have either a single torsion spring or a pair of extension ones. The torsion type is fitted above the door and uses torque to help the panels rise and descend. Extension springs are mounted on opposite sides of the door and extend and contract to help it open and close. Both types are susceptible to wear over time. They can become overstretched, and tiny hairline fractures may begin to form. The longer they are in service, the more likely they are to break, which is why they require regular maintenance to ensure their safe and smooth performance. At some point, all garage door springs will need to be replaced, though, which is where you'll definitely need our technicians to help you out. We strongly advise you do not attempt to replace your garage door springs without the proper tools, skills, and experience. The process is extremely dangerous and should only be performed by trained professionals. When these components break, the result can be catastrophic. Our experienced repair specialists can replace faulty components before they become a threat to you or your property. You can also join to our regular maintenance service and let us take care of your springs and increase their working potential. You can rely on Garage Door Repair Minneola for all your spring related needs, from maintenance to replacement. Call us today for more information.